The Pixi matches the Pre when it comes to music playback. The Pre was originally able to sync with iTunes, but Apple and Palm have been battling it out on that one. Right now, iTunes syncing is not supported. That means Apple users need to drag-and-drop their playlists manually onto the Pixi's 8GB storage card. The Pixi interacts with Windows Media Player no problem. 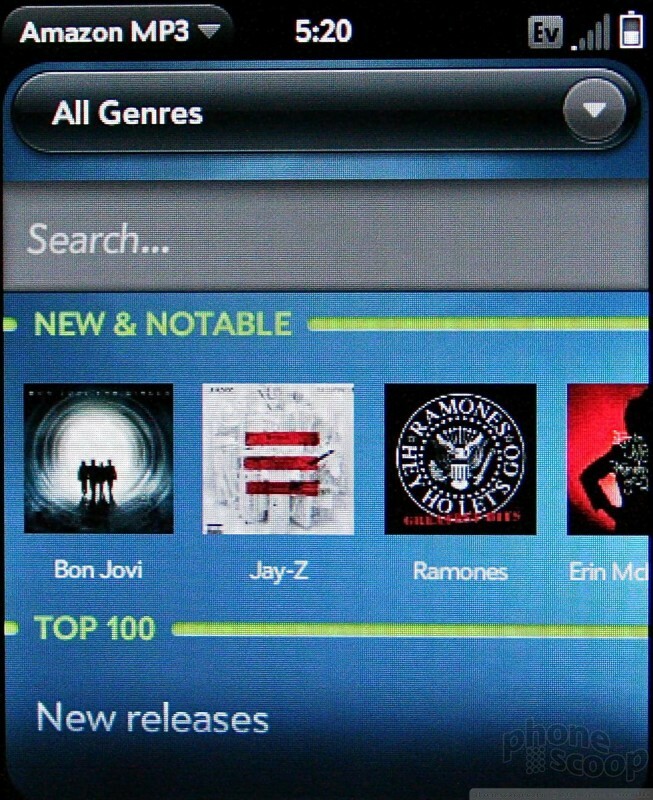 The music app lets you sort through your tunes via the usual methods: album, artist, song, genre, etc. In the main page, you can see how many songs you have, and a shortcut will let you shuffle and start playing your entire library immediately. The player interface itself is pretty cool. It will show the album art or the list of tracks, whichever you choose. You can loop the songs, shuffle them, or just sit back and enjoy. Rather than having to hit a small little button, a light press on the screen will pause playback. Press again to resume. You can also swipe in either direction to the previous or next track. Fun. What's really interesting is the options button, which pulls down some neat features. Say you're listening to the new Megadeth album. Open the options menu, and the Pixi will let you perform either a YouTube or Amazon MP3 search for, say, "Megadeth". You can search by the artist or the song itself. Searching via YouTube, for example, will take you to a list of Megadeth videos. Searching via Amazon MP3 will take you to a selection of music from that artist that can be downloaded via the Amazon MP3 store. You can buy single songs or full albums over the air using the Amazon MP3 store. The Pixi has a regular 3.5mm headset jack, meaning you can use most stereo headphones. It also can play back music via stereo Bluetooth. Music sounded really good, but the Pixi has no equalizer or any other way to control how the music sounds. It has, however, added the Pandora application, which allows users to create personal radio stations and stream music via the wireless network. Personally, I am disappointed by the 8GB storage limitation. I realize that for most people, 8GB is ample room for music and other media, but I would like more room. Because there is no microSD slot, that means 8GB is all you get.